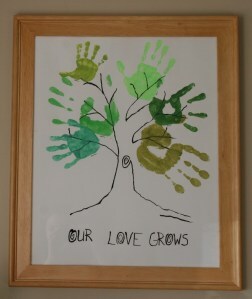 A repurposed frame provided the perfect base for some family art. We began with a free form tree outline in black. Then we had fun painting everyone’s hands in different greens to make handprint leaves. Below each handprint is the person’s name, so that we can look back and remember. It still needed a finishing touch, so I added Our Love Grows. 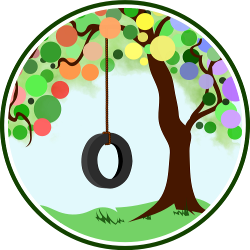 This post has been edited from a version previously published at Living Peacefully with Children. I picked up some acrylic craft paint from a local big name craft store when it was on sale for 50 cents a bottle. It was very easy, inexpensive, and fun!